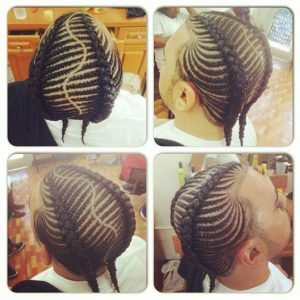 The term “fishbone braids” refers to a variety of styles that involve intricate cornrowed designs. 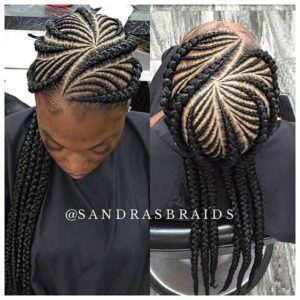 As the name suggests, the braids often resemble the shape of fish bones. 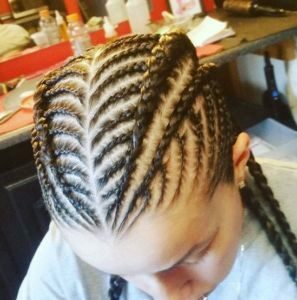 Fishbone braid deisgns are often executed by creating large or medium-sized cornrows layered on top of or in between smaller cornrows. 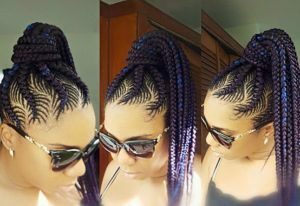 There are numerous ways to style fishbone braids, so you have plenty of options to choose from. 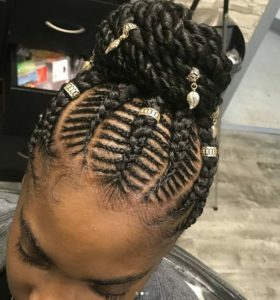 If you’re looking for a unique protective style, fishbone braids are a great choice because you can have them arranged into all kinds of intricate designs. 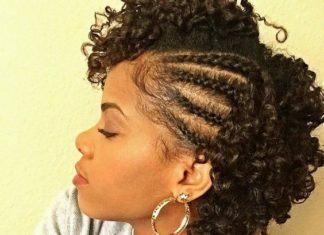 Here are 30 gorgeous fishbone braids styles to consider for your next protective style. 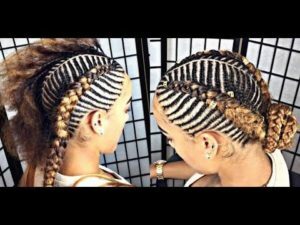 This look is a classic example of a fishbone braid style. 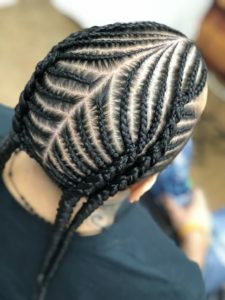 Two medium-sized cornrows are braided along each side of the head. 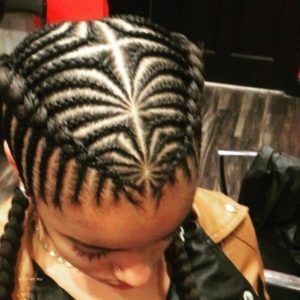 Smaller cornrows are interlaced in between to create a simple design. 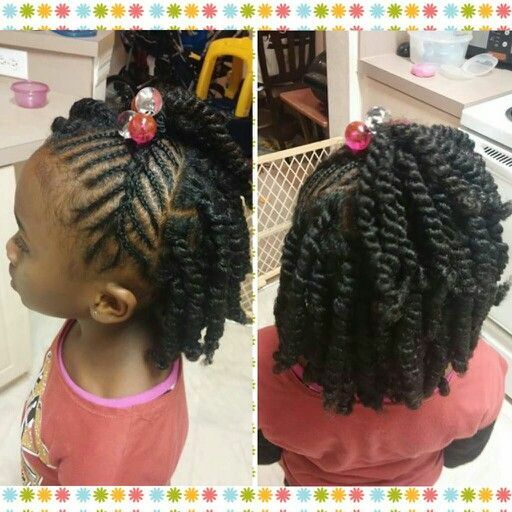 This gorgeous style looks great on little ones as well as adults. Two thick cornrows curve their way around and down the back of the head, allowing the ends of the braids to hang down over each shoulder. 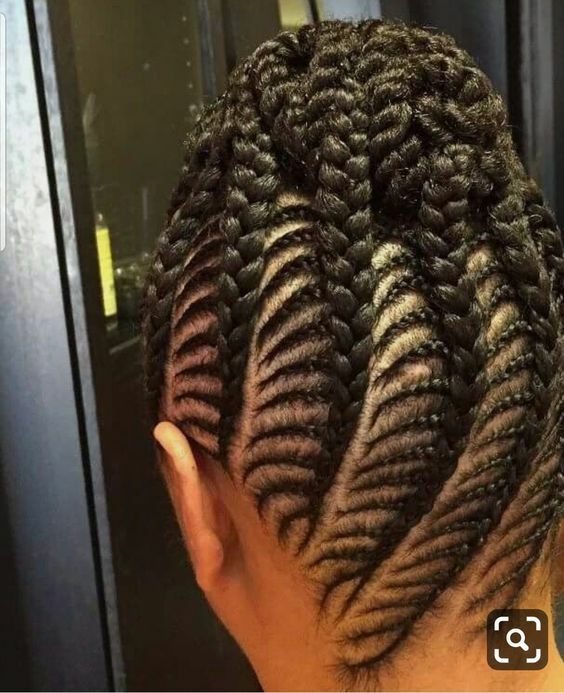 Smaller cornrows create a complex fishbone pattern around the larger braids. 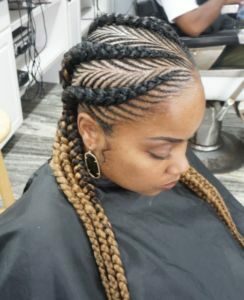 If you’re looking for a chic, show-stopping protective style, consider these beautiful fishbone braids, which are styled into a high ponytail. 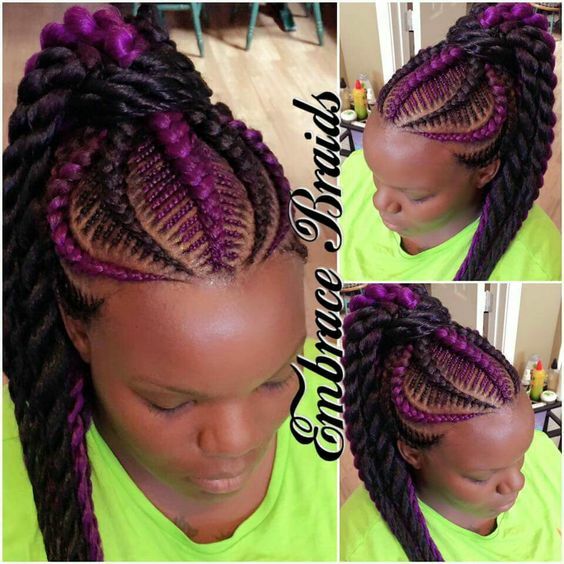 Micro cornrows and a touch of blue and purple really take this style up a notch. 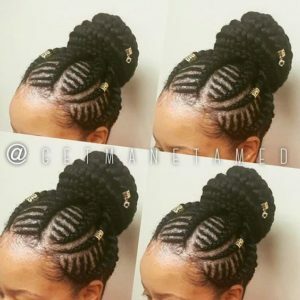 You can also easily switch up the look by styling the braids into a high bun. 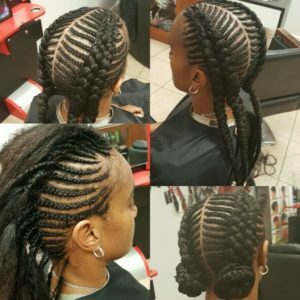 This style requires a skilled braider to pull it off. 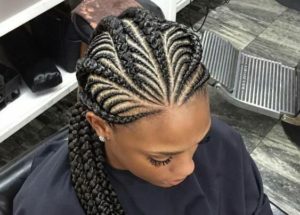 Two thick cornrows are braided in a zig-zag pattern, following the direction of the smaller cornrows that are interconnected. 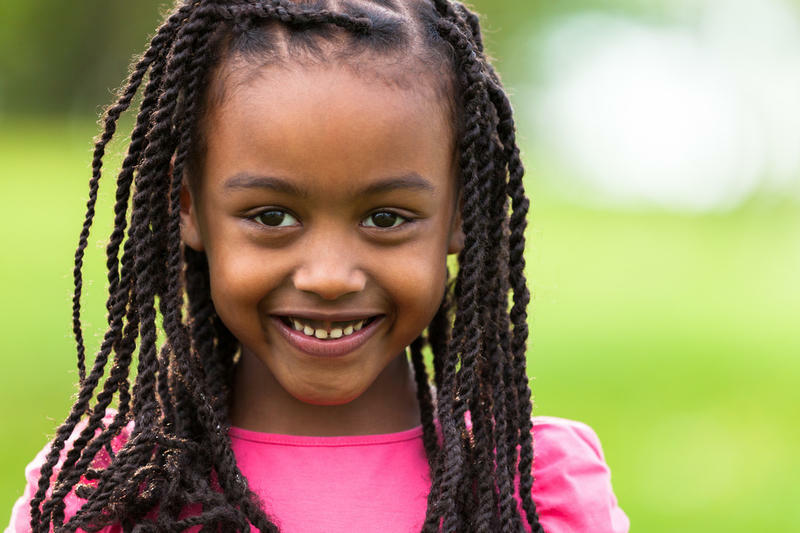 Adorn these braids with gold beads to finish off the look. Here’s another great fishbone braids high ponytail style. Purple and black braiding hair is used to create this pretty two-toned look and the ends of the hair are styled into twists. 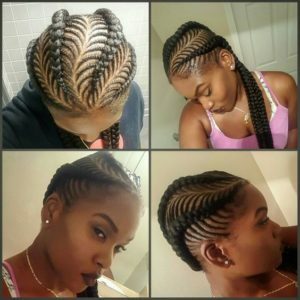 These two-toned fishbone braids are the perfect choice if you want a more intricate version of classic straight-back cornrows. A series of intricately designed cornrows feed into four thick, straight-back cornrows which are created with golden-brown braiding hair. 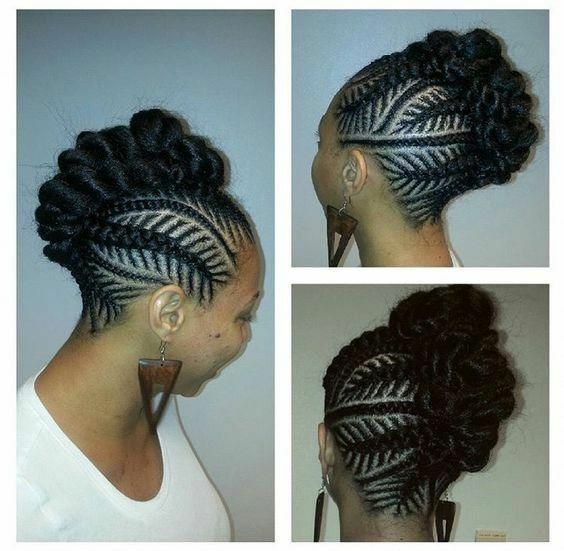 If you’re looking for a chic updo, look no further than this gorgeous fishbone braids style. 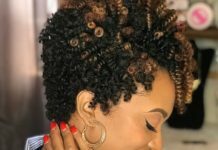 The hair is braided towards the center of the head to create a fancy frohawk style that’s perfect for both special occasions and everyday wear. Here’s another great fishbone braids style that’s perfect for special occasions. The ends of the hair are styled into a chic, low chignon at the nape of the neck. This style is both beautiful and practical: making it great for those with demanding schedules. 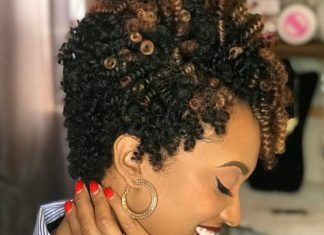 This style is a great choice for those who like to keep it simple. The hair is parted down the middle and braided into a fishbone braid pattern that results in double braided pigtails on each side of the head. If you like chunky braids, this style might be just right for you. The ends of the braids are styled into low, Princess Leia style buns at the nape of the neck. A simple fishbone pattern in the middle of the head helps contrast the look of the chunky cornrows. Here’s another great style for your little one. These fishbone braids are perfect for any time of year, and this style can be done with or without added hair. Add some classic bubble hair ties to the ends to give this look a youthful flair. These pretty fishbone braids are styled into a chic high bun. Gold beads and charms are added for embellishment, making this the perfect look for a special occasion. These pretty fishbone braids are styled into chunky pigtails which can be worn two ways: down or wrapped into two low buns. Both looks are equally cute, so you really can’t go wrong either way. 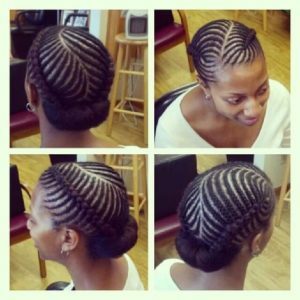 These gorgeous fishbone braids are styled into a simple low bun. Golden-colored braiding hair give this style a striking two-toned look that’s sure to stand out. Add a few gold beads to dress the style up even more. If high buns are more your speed, here’s another cute style that might be right up your alley. 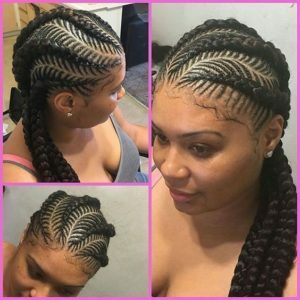 These fishbone braids are styled into a unique pattern and the ends of the braids are wrapped into a high bun. You can never go wrong by accessorizing with a few gold beads. Halo braids are always a great choice if you’re going for a regal look. This gorgeous halo braid is combined with an intricate fishbone braid pattern to create an even more striking final look. 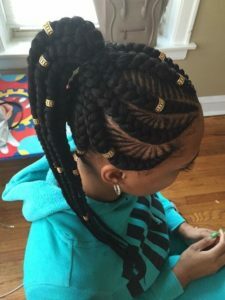 This style combines a classic fishbone braid pattern with twists that are styled into a high ponytail. The combination of braids and twists always makes for an interesting multi-textured look. You can wear the ponytail as is, or style the twists into a high bun for a different look. Here’s another cute fishbone braids high ponytail style. This is a great look if you prefer chunky cornrows. Dress up the look with some gold beads. You can also easily wrap the ends of the braids into a high bun. 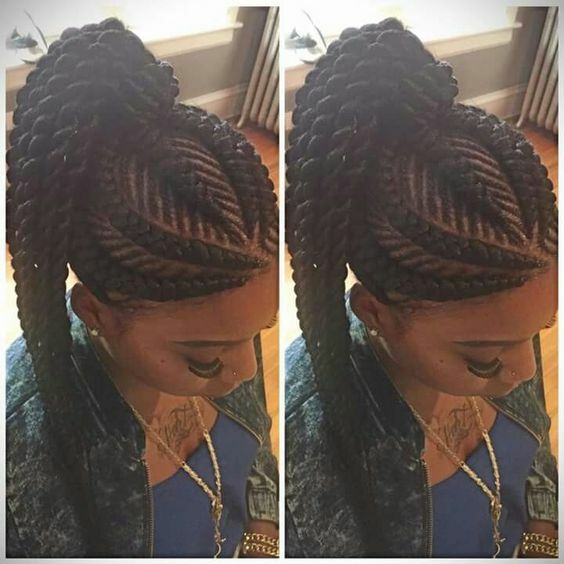 Here’s a gorgeous style that is designed to really show off the complex fishbone braid pattern. The ends of the braids are pinned up and away to create a unique, elegant updo. 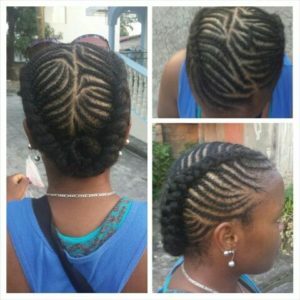 These beautiful fishbone braids are styled into a curved pattern so that the ends of the braids fall over one shoulder. 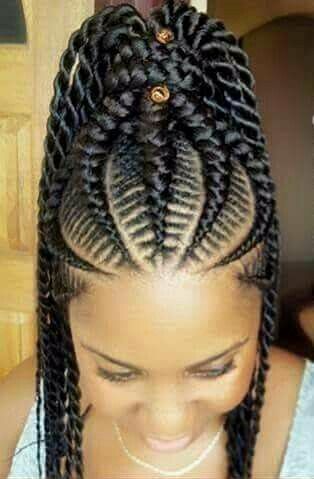 You can also style the braids into a simple side bun if you want to switch it up. 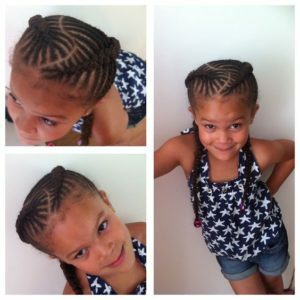 Here’s a simple fishbone braid style for the little ones in your life. 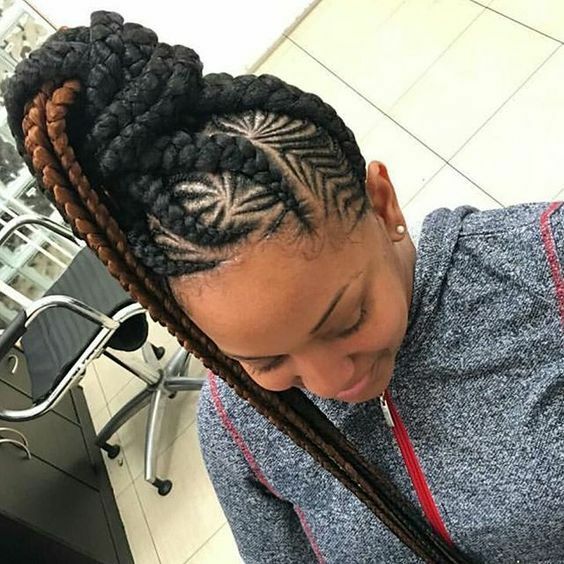 Cornrows on one side of the head are intertwined to create a high ponytail. 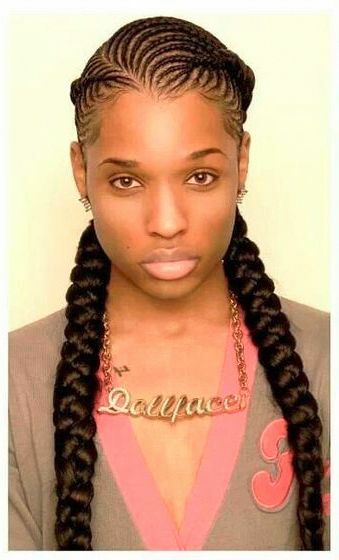 The rest of the hair is styled into two strand twists. Add bubbles to match your little one’s outfit to finish off the look. For this style, the hair is parted down the center to form an S shape. This style looks great on both men and women, making it a great unisex option. These fishbone braids take on a complex design that is sure to turn heads. 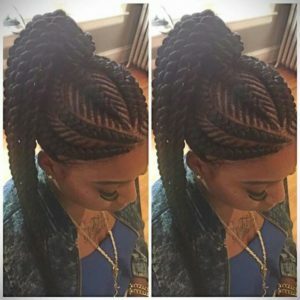 If you’re looking for a unique fishbone braid hairstyle, you can’t go wrong with this one. 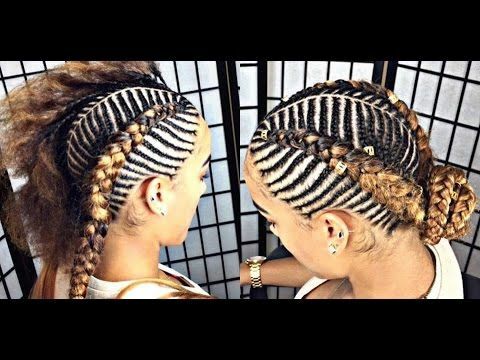 These fishbone braids feature a complex criss cross pattern along the sides, which gives this style the appearance of a faux undercut. The braiding hair used is a lighter shade than the wearer’s natural hair, creating even more contrast. These flawless fishbone braids feature a distinct braid pattern and two-toned color. The ombre effect helps create a gorgeous color contrast. 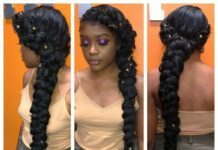 You can wear the ends of the braids down, in a ponytail, or in a low bun. This gorgeous style is a modified version of your classic halo braid. Featuring a complex fishbone braid pattern, the ends of the braids are wrapped around and pinned in the back. This style can be created with or without added braiding hair. 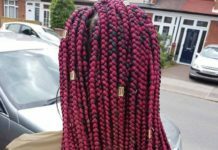 These beautiful Ghana braids feature a distinct fishbone braid pattern that curves its way around the head. The ends of the braids hang over one shoulder in a chic side ponytail. These feed-in braids feature a beautiful fishbone pattern that really shows off the braider’s skills and precision. 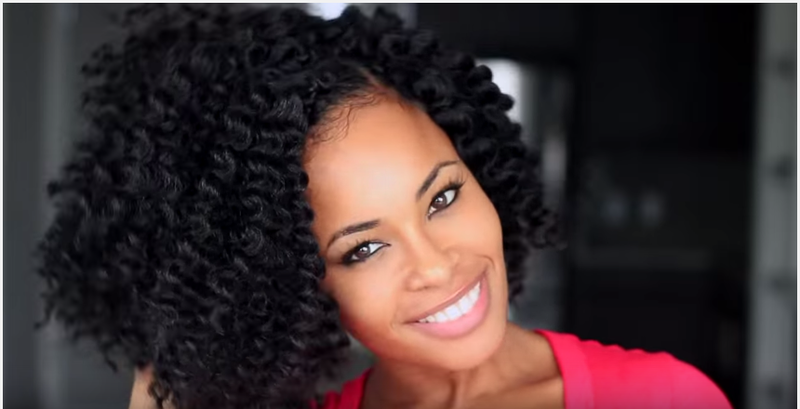 This is the perfect protective style for any time of the year. Simple but chic, these fishbone braids are styled into chunky double braids. 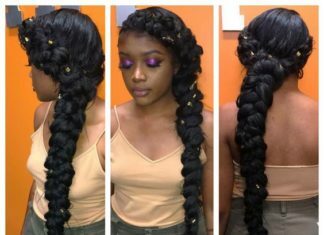 This is a beautiful styling option for those who like chunky braids. Here’s another style that combines fishbone braids with twists. A simple braid pattern is used to style the hair into a high ponytail while the twists cascade beautifully over the shoulders. 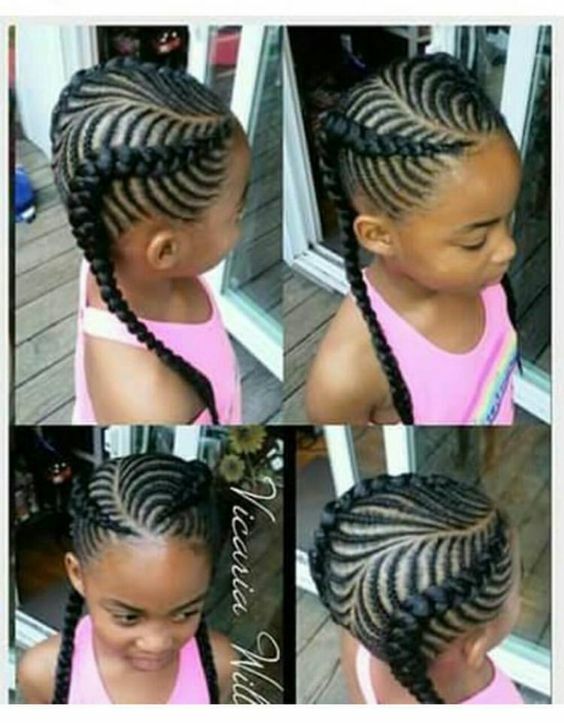 For this style, the hair is braided into a simple but cute fishbone pattern. 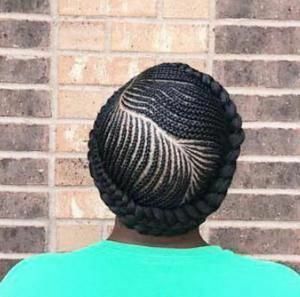 The ends of the braids are wrapped into a high ponytail. 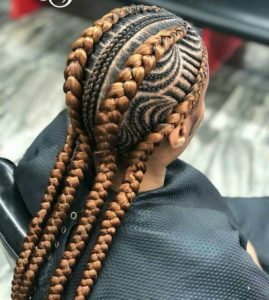 Use golden brown braiding hair for a few of the braids to add a pop of color to this style. These beautiful side-swept braids are the perfect example of a classic fishbone braid pattern. 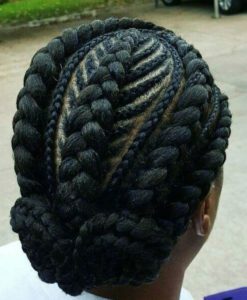 The intricate design snakes its way around the head so that the ends of the braids fall over one shoulder. 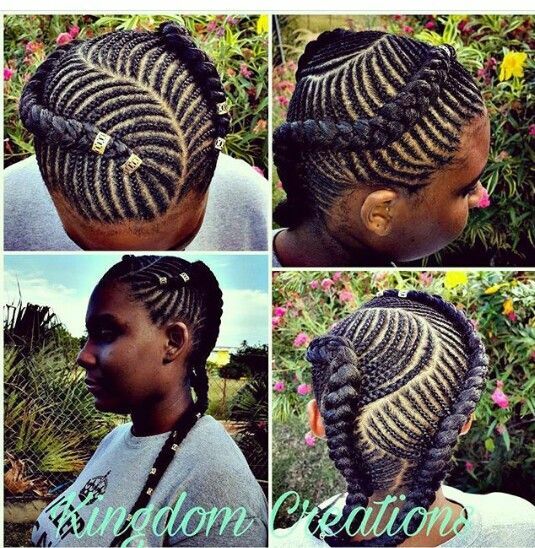 This is a great protective style option that shows off the beauty and versatility of fishbone braids.